Drill Pipe Market size was valued over USD 800 million with annual deployment to exceed 35 million feet by 2024. Growing investments across upstream sector coupled with ongoing exploration & production of unconventional resources including shale and tight gas will drive the drill pipe market size. The Kuwait Petroleum Corporation (KPC) announced an investment of over USD 115 billion across oil and gas between 2015-2020. Rising focus to reduce dependency on imports will further stimulate the industry growth. Ongoing government ventures to increase crude production along with rising demand for petroleum products will positively impact the drill pipe market size. For instance, the federal government of Iraq, in 2018, announced its oil production target to reach 7 million bpd by 2022. Furthermore, wide availability of untapped reserves in combination with companies’ oil production targets will complement the business growth. Rising investments toward technological enhancement with an aim to improve efficiency across the complete spectrum of E&P technology will stimulate the drill pipe market growth. Recent innovations including pad and horizontal drilling have reduced the downtime of drilling rig which in turn will propel the industry growth. Furthermore, development of extreme reach drill pipes for extended reach drilling will propel the business growth. Increasing primary energy consumption across regions including North America, Europe, Asia Pacific and Middle East & Africa will drive the drill pipe market share. As per BP statistical review, the global energy consumption increased by 4.3% between 2013 to 2017. Moreover, stabilizing crude oil prices coupled with changing demographics, increasing disposable income, and expanding population size will positively influence the industry landscape. 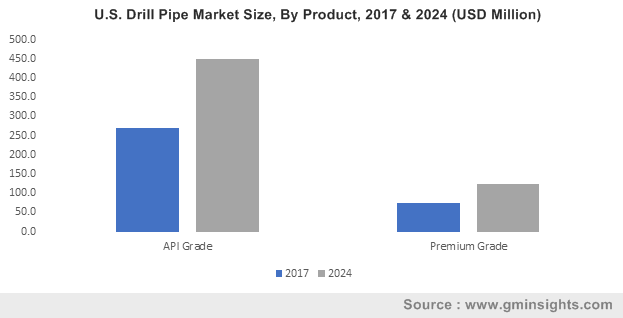 API drill pipe market is anticipated to grow over 7% by 2024. Cost-effectiveness, low temperature toughness and high torque resistance to withstand the harsh environmental conditions, are some of the underlying parameters which will propel the product adoption. Premium drill pipe market will witness growth on account of its suitability for deep-water and ultra-deep-water exploration along with increasing offshore production. For instance, the International Energy Agency (IEA) under New Policy Scenario, projected the offshore oil and gas production to reach 57 mboe/d by 2040. In addition, the ability of these drill pipes to effectively function in difficult geographical terrains like rocky layers will thrust their deployment. Onshore drill pipe market is predicted to witness growth on account of increasing rig count coupled with lower operational risks as compared to offshore drilling. Ongoing shale projects coupled with huge untapped potential will drive the industry growth. In 2017, Noble Energy announced to allocate USD 1.8 billion across onshore with major focus toward Eagle Ford, DJ Basin and Delaware Basin for drilling and completion. Rising focus toward heavy oil reservoir will further stimulate the product demand. Offshore drill pipe market is predicted to expand over 8% by 2024. Rising number of onshore mature fields along with increasing investment toward ultra-deep exploration will propel the business growth. For instance, National Hydrocarbon Commission of Mexico (CNH) announced that Qatar petroleum & Shell gained the rights for exploration blocks as part of the Mexico Deep Water Round 2. Innovation and digital transformation in order to reduce the operational cost will augment the business growth. China drill pipe market in 2017, was valued over USD 150 Million. Increasing demand for LNG & piped gas from residential and commercial sector will stimulate the product penetration. For instance, as per the U.S. Energy Information Administration, China natural gas consumption is predicted to reach 38 billion cubic feet per day by 2040. Further, shifting trends toward E&P of unconventional well including light tight oil and shale will drive the business growth. North America drill pipe market will witness robust growth owing to rising capital expenditure from independent players across the region. For instance, according to Scottish Development International, the capital expenditure of Exxon Mobil in offshore oil and gas was estimated to be USD 927 million from 2008 to 2012 and reached to USD 7,328 million for 2013-17 across the region. The UAE accounted for over 9% of the Middle East drill pipe market share. Rising focus to achieve diversified economic growth along with various government schemes to enhance crude oil production will propel the business landscape. For instance, ABU Dhabi National Oil Company (ADNOC) plans to double its rig count by 2018 in order to increase their production capacity. Russia drill pipe market is predicted to grow over 5% by 2024. 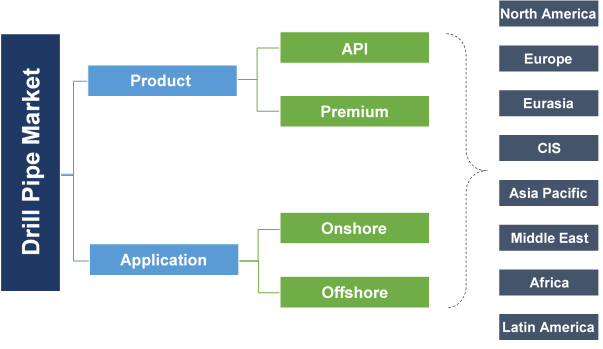 Increasing consumption of natural gas, technological advancement in ultra-deep drilling and favorable policies from respective government will fuel the product adoption. For instance, in 2018, Halliburton released new ultra-deep resistivity service that allows operator to map fluid and reservoir boundaries. Key industry participants include DP-Master, Oil Country Tubular Limited, TMK Group, Drill Pipe International, Vallourec, Texas Steel Conversion, Ferrostaal Piping Supply, Holly Pipe Corporation, E&M Supply Group, Hilong Group, Jiangyin Long Bright Drill Pipe Manufacturing Co., Premier Drill Products, RK pipe & supply and Tejas Tubular Products. Drill pipe are hollow thick-walled pipe made of threaded ends which are predominantly utilized for drilling activities. It is a part of drill string which is installed in rig for exploration & production of oil & gas exploration activities. It allows the flow of drill fluids and is also used for connecting the surface equipment for rotating, raising and lowering the assembly.